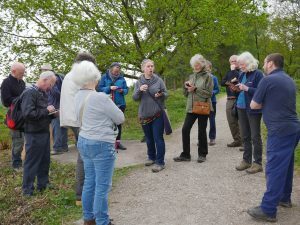 On Saturday 12th May, the H&W Earth Heritage Trust held its AGM in the Lickey Hills School Room, with a Champions-led walk scheduled for the afternoon. 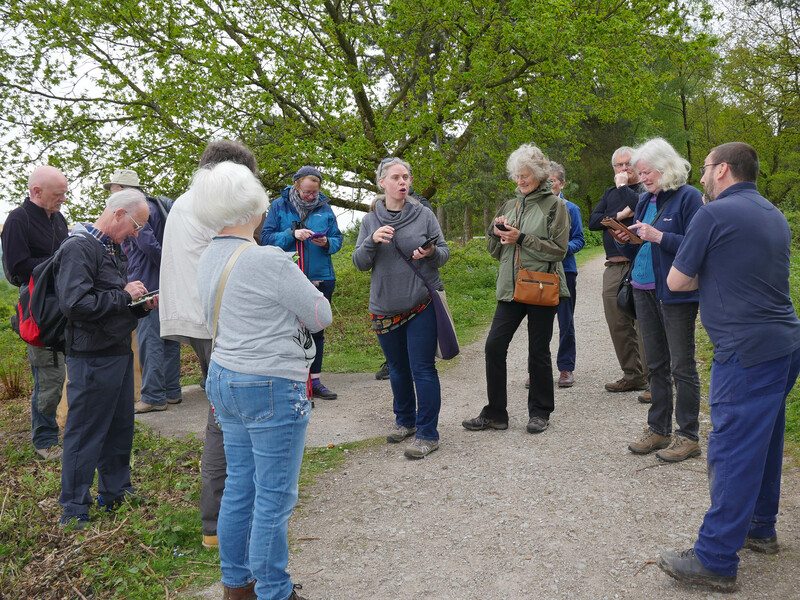 The Champions had spruced up Warren Lane and Barnt Green Road quarries in advance of the event, and aimed to follow the usual Champions Trail, including some of the new discoveries we’ve made in the years since the group was formed in 2011. But in the event, there were far more surprises in store for our guests! The Champions project left us with three information panels for display in the Visitor Centre, and three in Barnt Green Road Quarry. These provide a lot of information and are still very much appreciated, but we soon lamented that there was no interpretation board on the main Bilberry Hill ridge. But luck was on our side! 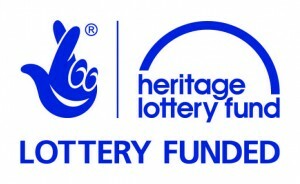 In late 2015 an opportunity arose when the EHT received Heritage Lottery funding for a project entitled ‘Voyages in Deep Time’. Four sites were chosen to be researched for use in geological teaching apps for youngsters. 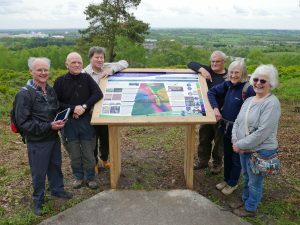 Fortunately for us, the Lickey Hills were amongst the chosen sites, and a small financial contribution from our Champions group ensured a ‘spin-off’ project to create a new information panel. 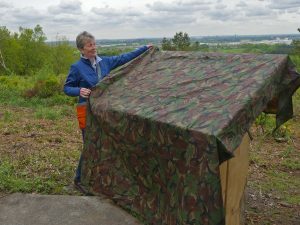 With expert input from those directly involved in the project, plus two years of hard work from members of the Champions group, the panel, entitled ‘Rocks & Landforms – view from Bilberry Hill’, was completed and ready for installation only a few days before the AGM. 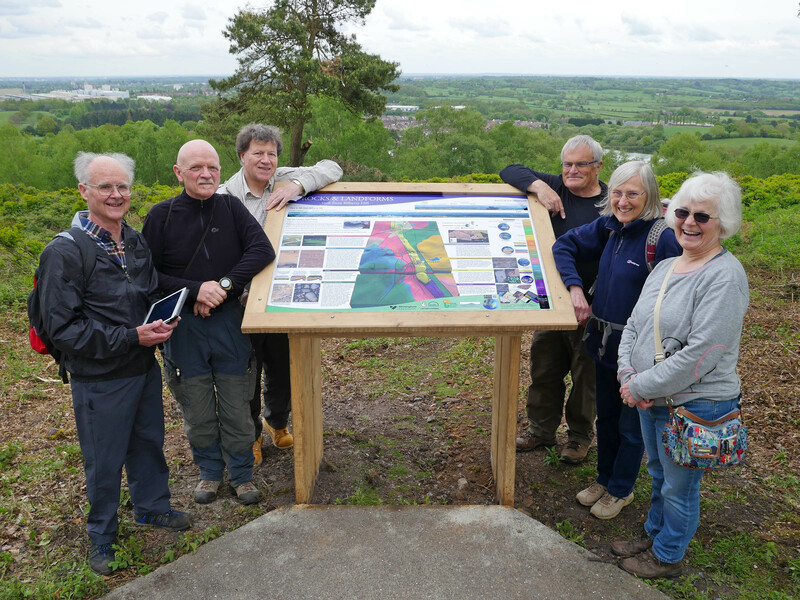 Throughout the whole process the Lickey Hills Ranger Team were fully supportive, and it was thanks to a heroic effort on their part that the panel was installed in a prime location near the car park on Bilberry Hill ridge – just in the nick of time! During our afternoon walk on 12th May, we were delighted that the EHT’s outgoing Chairman, Sue Hay, was on hand to officiate with a ceremonial unveiling of the panel, and we hope that it will be enjoyed by visitors to the Lickey Hills for many years to come. But there was yet more to come on this very special occasion! One of the purposes of the new information board was to promote the ‘Voyager’ app with its Lickey ‘voyages’. We were lucky to have with us for the occasion two of the main players in the ‘Voyages in Deep Time’ project team – Mike Brooks who created the apps (and the art-work for the panel), and Beth Andrews who is the outreach manager for the project. Ultimately there will be different apps aimed at different levels: one designed for 10 – 14 year olds in the form of a game, and another aimed at A level geology students. The junior app was just about ready for a test, so Beth came armed with tablets ready to go, and at various locations we found ourselves reading about the geology to the accompaniment of a soundtrack relevant to the palaeoenvironment, answering questions to gain points, and taking evasive action in the face of hazards to avoid losing points – or worse! The Lickey Champions and Rangers are proud of our new information panel, and proud to have played our small part in the ‘Deep Time’ project and the development of this wonderful new teaching tool. You can download the Voyager app from Google Play Store or Apple App Store, and download the Lickey voyages from within the app. 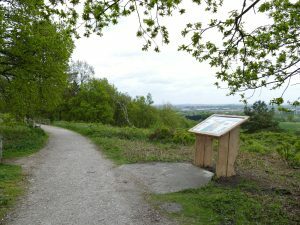 Come to the Lickey Hills! Read the information panel, try out the app, follow the ‘Champions Trail’ and just immerse yourselves in the amazing geological story stored in the rocks and the surrounding landscape of the Lickey Hills. For more information on the Voyages in Deep Time project and the app please visit www.deeptime.voyage or email e.andrews@worc.ac.uk.